The ‘Arabian Spring’ soon became something quite different. How could such an uproar against injustice and corruption end in despair, death and chaos? 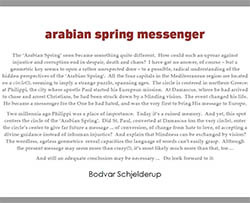 I have got no answer, of course – but a geometric key seems to open a rather unexpected door – to a possible, radical understanding of the hidden perspectives of the ‘Arabian Spring’. All the four capitals in the Mediterranean region are located on a circle(! 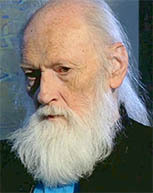 ), seeming to imply a strange puzzle, spanning ages. The circle is centered in northern Greece: at Philippi, the city where apostle Paul started his European mission. At Damascus, where he had arrived to chase and arrest Christians, he had been struck down by a blinding vision. The event changed his life. And still an adequate conclusion may be necessary ... Do look forward to it. Read the booklet by clicking the front page above. This booklet has 8 pages in PDF-format, and may be downloaded or read free of charge.